LOCATION LOCATION!!! 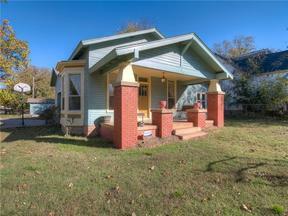 In the heart of Guthrie, minutes from I-35 on a corner lot with a white picket fence! This 1920’s home has 3 beds, 2 baths and is a mother in law plan with original hardwood floors, built-ins, bay windows, 2 beautiful mock fireplaces, updated kitchen, breakfast nook, formal dining room, and a large laundry room. The backyard features a huge deck for relaxing or entertaining and a detached garage. Schedule your appointment today to see all the charm of this home. This information is believed to be accurate but is not guaranteed. Subject to verification by all parties. The listing information being provided is for consumers’ personal, non-commercial use and may not be used for any purpose other than to identify prospective properties consumers may be interested in purchasing. This data is copyrighted and may not be transmitted, retransmitted, copied, framed, repurposed, or altered in any way for any other site, individual and/or purpose without the express written permission of MLSOK, Inc. Information last updated on 04/21/2019.